"Sometimes Life Looks Like Music." One of the best things about commuting to work is that I get to see the sunrise every morning. And every once in a while it is so beautiful that I have to snap a picture while I am stuck in traffic. This is a spot on Clay Road in Houston, Texas, that has a lot of power lines intersecting. There are lots of spots like this in my beloved sprawling metropolis and there is something strangely beautiful about them. When I drive past this spot I always notice how the lines look like musical score and when I saw this sunset behind them I had the thought "Sometimes life looks like music". And I loved this idea. 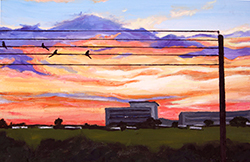 So as I painted this beautiful sky I loved it so, and thus became scared to paint the electric lines even though that was the whole point. But I perserved and in the end I even had an idea to add the birds as musical notes. On the left side they play "Joy to the World" and on the right they play "And heaven and nature sing". God gives us so much beauty to see even in the ordinary places. I am so glad that God helps me to see nature sing to him songs of praise for his incredible artistry.